The OL women had their official photo taken with the team sponsors at the Groupama Stadium on Monday afternoon. 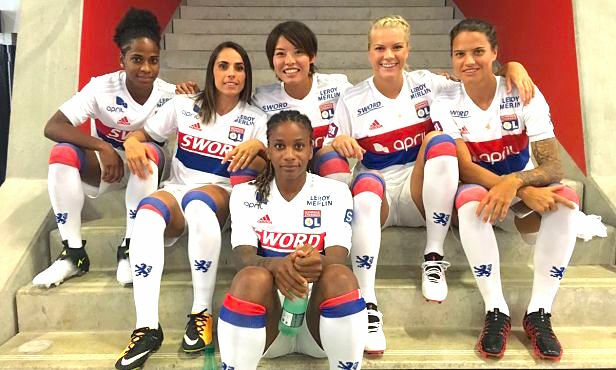 After coming back from the Toulouse International Ladies Cup, the OL Women players and staff had their official photo taken at the Groupama Stadium. Before posing, they ladies had their makeup done by their official partner, LR Health & Beauty, who were represented by General Manager Pascal Clément. The photos and videos will now be fixtures on the Groupama Stadium screens. Wendie Renard and her teammates then posed around President Jean-Michel Aulas and coach Reynald Pedros. The women's team's sponsors' representatives were also present for their official photo: Bruno Rousset (Pdt d'April), Jacques Mottard (PDG de Sword), Guy Sidos (PDG de Vicat), Yannick Lecoanet (Dir. Régional de Leroy Merlin), and Paul Chaperon (Dir. Communication de Keolis).